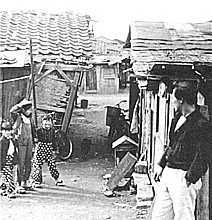 Nancho Advisory: Some three million Japanese are burakumin, a hereditary group who for centuries were the untouchables of Japanese society. Although their legal outcast status was abolished in 1871, many people still regard them as unmentionable, unemployable or unmarriable. Burakumin (literally,, "hamlet people") is the modern, official word, but in private the traditional and highly pejorative term eta is widely used. Nadamoto Masahisa works at the Buraku History Institute in Kyoto. A Kobe native, he holds a degree in contemporary history from Kyoto University.